In a way, the story of Upfluence mirrors that of influencer marketing itself. Founder and CEO Kevin Creusy stumbled upon the practice organically, as he sought alternative ways to market his various business interests. Influencer marketing itself is all about the organic connection, and as the industry has refined itself and matured over the years, so has Upfluence. The rebrand was a result of Creusy’s own re-evaluation of the influencer marketing landscape. He saw the value of the influencer long game, that the marketing was more successful when it was the result of organic connections and true collaborations. The one-and-done transactional nature of the marketplace wasn’t the right direction to take, and the Publishr was shut down. Facade was renamed Upfluence, because consistency is a good thing, and over the course of the last year Creusy & Co. migrated—and then improved—the management tools into the search platform for in all-in-one experience. While they were at it, they added in a flexible yet robust social listening feature that extends Upfluence’s capabilities well beyond what their initial two offerings were ever capable of. Upfluence is built on a massive database—nearly 1 million influencers with a collective reach of 82 billion followers. Their proprietary algorithms indexes and updates all their profiles in real time, with every piece of content analysed for reach and engagement. For Instagram, basic audience data is also available (age, gender, location) provided the influencer authorises it. Brands and agencies can search through Upfluence to find influencers using as many keywords as necessary. A pizzeria that uses organic and local ingredients isn’t going to get anywhere by just looking for influencers who’ve posted about pizza. Everyone likes pizza. By drilling down with keywords—food, local, and organic—you start to narrow the pool a little bit. What’s especially cool is that you can place a relative weight on each keyword (that is, make some more important than others) and end up with some very precise results. It can be narrowed even further using criteria like location, social platform, or number of followers. The ability to filter by audience data is something new here, and very much welcome. The bad news is you can only do it on Instagram, but the good news is: you can do it on Instagram! Facebook and Twitter are becoming increasingly irrelevant for influencer marketing, while Instagram has maintained its dominance for social media marketing. Still, we’d like to see a greater emphasis on audience data beyond simple demographics on one platform. Psychographic attributes like brand affinities, cultural interests, and more are all readily available, and of great use to marketers. And while we’d never fault anyone for ignoring Facebook and Twitter for their influencer marketing, YouTube is still very much an important social channel to the industry, and getting at that audience data is crucial to running successful campaigns there. The interface for all this is intuitive, with results showing up in near real time. Or, rather, the result statistics show up—and this is one of those design elements you didn’t know you wanted until you see it. Generally, influencer searches can be overwhelming, as you search for some term and loads of results appear on the page. So you try and filter it down, the results get narrower but you’re still looking a dizzying amount of data. With Upfluence, the left side of the screen is where you type search terms, and the right side displays the number of results based on your search—and categorises them into groups based on follower size. It’s cool to watch the stats and pie charts refresh themselves as you narrow your search, but what’s great is not being distracted by a bunch of irrelevant profiles while you work your way down to a manageable number. Here, “manageable results” could mean “thousands of influencers,” but remember: searching multiple keywords (each weighted for relevance) means those results are going to precise. And they’re displayed in an easy-to-read format, one that doesn’t overwhelm the eye even when you dig deeper into individual profiles. Scroll the listings for high level information—profile bios, followers per platform, engagement rates on each, influence and relevancy scores, and the titles of their most recent posts. See who they might have collaborated with in the past based on brand mentions. Dial in further and find out the reach and engagement rate for each post. With this many results, Upfluence made sure that their customers could organise them effectively. There are plenty of influencer discovery tools that offer list management, but this platform lets you do more with a list than simply categorise influencers. Particularly powerful is the ability to export these lists to CSV files, and then add new columns of data that you can bring back into the platform. The main function of this works hand-in-hand with another of Upfluence’s new features: its emailing tool. When brands or agencies send invitations out to the influencers they want to work with, sending a generic form letter simply won’t do. This goes back to Upfluence refocusing its vision to nurture organic and long-term collaborations. The problem is, it’s hard to personalise a letter you need to send to hundreds of people at a time, even with templates. By creating new data fields in the CSV, you can incorporate more personal details into the message templates, which can refer back to these data fields to fill in blanks. So, if you’re a dog food brand targeting dog owners to collaborate with, you can add a field with their dog’s name that the template grabs as it sends messages out—and every influencer gets her own personal message. 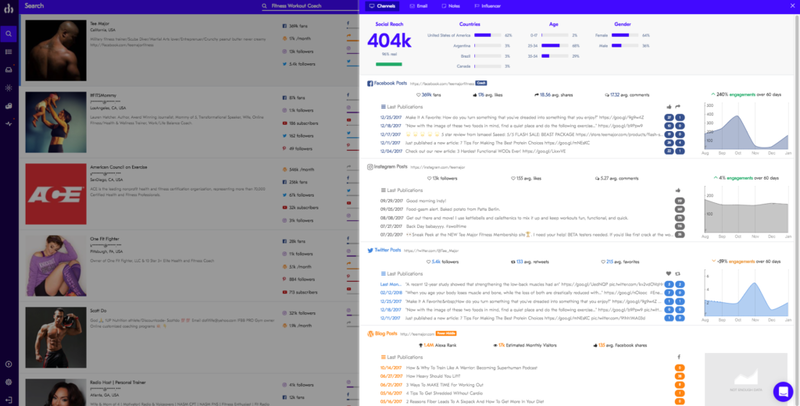 All email correspondence is archived into Upfluence for easy reference—all team members have visibility into any message sent to or from each influencers. 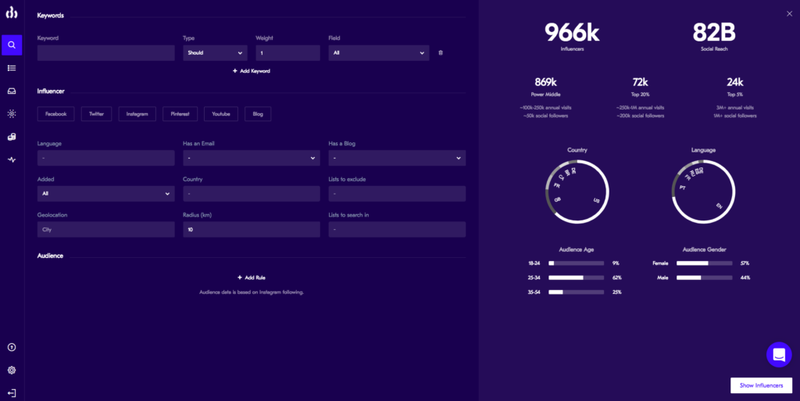 There’s also a lifecycle management component that shows you your progress for each influencer—who you’re negotiating with, who you’re waiting for to complete content, who’s waiting on payment, those kinds of things. The messaging function is a highlight in what is already a very complete set of tools to manage your influencer relationships. Finally, there’s the social listening component, which is more flexible than most we’ve seen. As you’d expect, you can create several streams with different purposes. Some could simply be monitoring certain hashtags to get an idea what’s trending, as means toward creative inspiration. You can create streams to monitor specific influencers, like ones you’ve got your eye on that you want engage with. You can monitor your competitors, their activities and their mentions, if you wanted to do some opposition research. 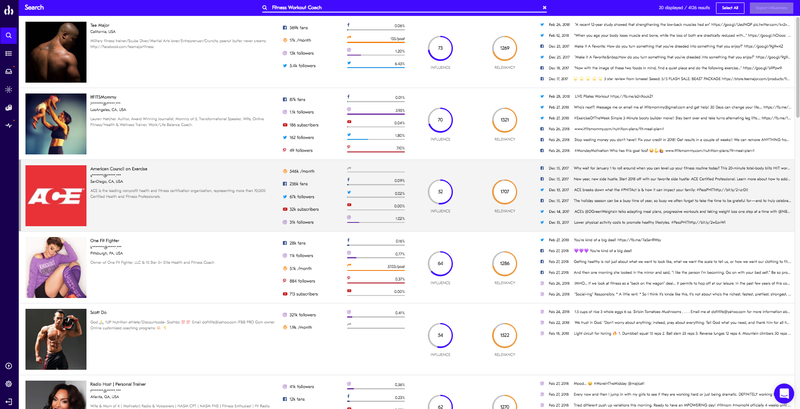 And you can mix and match any of the criteria you want to stream for to find out highly specific things—listen for campaign-specific hashtags used by influencers you’re working with and you’ll get the data you need to see how your own campaigns are doing. The goal of any influencer marketing platform is, ultimately, to ease the headaches of marketing at scale. That means making it as simple as possible to communicate with all your influencers, track their progress, monitor your campaign content, and get relevant, actionable data when all is said and done. Where many developers approach this by using a one-size-fits-all approach, that can result in unwanted rigidity and unforeseen limitations. Upfluence side steps this by using an approach that stresses flexibility. It’s a little more complex than other platforms, but it isn’t any more complicated. That is to say, it’s not hard to learn—and it’s easy to use once you’ve learned it. The maturation of Upfluence as a product over the last year is truly impressive, and it’s probably only a matter of time before our last remaining criticism around the audience data becomes the next thing we’re praising them for. We take care of your inluencer marketing campaigns, and provide content marketing services tailored to your needs.